New Support website is now live! We've recently redesigned our Tech Support website in order to streamline the user experience and make it easier to navigate. 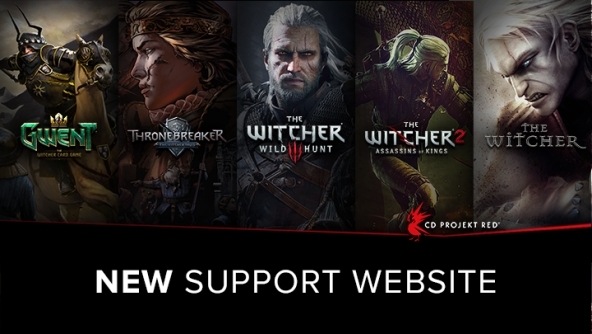 Now you can find information about all CD PROJEKT RED’s games in one place! Are you experiencing any issues? Choose a game, choose a platform and learn how to solve them! If you didn’t find the answer to your question you can contact our Support Team directly via “CONTACT” button. We'd like to encourage you to report bugs and usability issues via the website. We track every issue, detect trends, and, together with the rest of the dev team, make sure that the matters most important for the community are properly addressed. Those are good news. I am going to make your technicians busy. I play since Gwent went out of beta, but I faced so many bugs, that I could not believe, that it is not in beta anymore. Anyway, good step in right direction. It seems, that I was praising too much. Why do I need to send dxdiag report when I only want to report problem with contract? Page https://support.cdprojektred.com/en...act-wasnt-credited-when-requirements-were-met is mentioning only 3 things, that are required and dxdiag report is not amongst them, but form does not let me submit problem unless I will send dxdiag report too. I definitely do not want to send you that dxdiag, because I think, it is unnecessary. Do you, please, have any rational explanation why do you need my PC dxdiag? It was live weeks before you made this announcement. CDPR, what's wrong with you ? Only what your support is able to do is write "we are sorry" and "we are monitoring situation/bug" so you can even close support page and nothing will change.